first off, nice blog. oh, and i saw you on foxnews the other day, and something you said cracked me up; i don't remember what it was, but it was funny anyway. "Maybe I'll buy one of your t-shirts and send you a photo. I think I'd look better in one than Margaret Cho." i cannot argue with that statement, since you're hot and she's a smelly, unfunny communist, but i have one job in this precious blogosphere, and that's to be frank's official t-shirt babe. i went through a brutal 4-hour photo shoot with my sister getting my entry picture just right and a long 4-day weekend waiting for frank to post the winners, so you see, i have blood, sweat and blisters wrapped up in this t-shirt babe thing. having said that, there's a t-shirt babe war on between another babe and me, and i'd like to win, so please do buy frank's t-shirts. thank you. *sigh* but does she have to look so good in it? ... to go visit your favorite blog and see your picture there. WEIRD. aaaaaand even weirder to find yourself hitting F5 to refresh the screen and see what picture comes up next! what kind of narcissist does that make me?? did the psycho ex have that big an influence on me so i'm now a self-loving freak? actually, Frank posted the whole gallery of pics that i sent him, even one that i sent him as a joke (and learned that he cannot be trusted, so glad i didn't send him the really awful ones), and he said that he picked his favorites and has them randomly scrolling on the sidebar. so i kept refreshing to see which ones were his favorites; then i realized that it made me feel very vain, so i stopped that. for about 5 minutes, then i started again. shame on me. i got 4* AWESOME TSHIRTS and my amazon.com rebate in the mail today, what a way to come home!! i shall model my KNOW THY ENEMY: TERRORISTS shirt tonight at chorale rehearsal. woohoo!! *i ordered my NTM shirt long ago. it would seem that the runner-up of that little contest that I WON has, at the behest oh, willow used that word prodding of Kevin Aylward of Wizbang blog, nice ta meetcha, decided to engage in a T-Shirt Babe war against yours truly. the stakes? hey, what are the stakes? a date with the great one, the master of the blogwars, Frank J? ok, i'm in! what? you say that's not part of the deal? well, i'm SarahK, the ONE AND ONLY IMAO T-Shirt Babe, i say it is so! still not part of the deal? then i will settle for mmmmmmmmmmmmmmmmm -- oh, sorry, James Purefoy is way hot -- what was i saying? oh yes. i will settle for being the undisputed BlogoBabe for days years to come. en garde, Wizbang and Willow! Frank J and Sarah K do not bow, bend or break. all we do is sell the most t-shirts. speaking of, get out there right now, ronin, and buy Frank's t-shirts! and Willow, no lime jello -- i prefer pistachio. Mwahahahahahahahahahahahahaha! may the best first babe win. anyway, this has been a busy week, and i'm exhausted. i've pinpointed the ONE reason i'm so tired... no afternoon naps!! can you believe it?? when i left the job at the end of March, one of the first ever habits i instituted was the mid-afternoon nap, and i haven't had a nap since like Saturday, and i only had that one because i felt, at the time, as if my head were in a vise (2nd worse headache i can ever remember having, thanks Texas weather)... anyway, i'm seeeeepy. since it's 2:15 a.m., one would think that i would go to bed, but nope. i'm a moron sometimes. Wow... I didn't expect to win...I'm just so, wow! Thank you all so much! It was an honor just to nominate myself, and to be in the running with all of these other hot babes! I didn't even prepare a speech... but since I love to hear myself talk, I'll give it a shot... Ever since I was a tiny 5-ft.-tall girl of 27, I have dreamt of being a t-shirt model, nay, more! I have dreamt of being the one and only IMAO T-Shirt Babe!! Yeah, ok, this is about me. Anyway, I would like to thank the judges who voted for me. I don't know who you are, except that you are not John Hawkins (bah), but what really matters is that my traffic has substantially increased, mostly due to hits from IMAO and Blackfive, which makes y'all my favorite judges... And to the other babes, I would just like to say that y'all all deserve this at least as much as I think you do; what a hot readership Frank has! I would also like to thank my new fans out there; whether you've become a new regular and/or commenter on my blog or sent me fan mail or unsolicited photos (you know who you are! ), you have made me feel like a totally hot babe, I love y'all! Finally, I would like to thank John Kerry (who, by the way, served in Vietnam), the French (who surrendered to my photo immediately upon seeing my Smith & Wesson), hippies, commies and terrorists, all for being such easy targets for ridicule; you increase my hawkishness exponentially. I hope to make Frank J, the IMAO readers, the other judges, etc., proud as the IMAO T-Shirt Babe. God bless our troops and our President, and God bless America. UPDATE FROM THE GREEN ROOM: I forgot (actually didn't, but when you think it out all day in your head before you're actually out of the black hole and can post something, things come and go through your empty head.) to thank my dear long-time friend Juan, who got me started in this whole blogging thing. I figured if he could do it, so could I. ;) So thanks J.
UPDATE FROM THE AIRPLANE: What a horrible oversight! A gracious reader has pointed out that I didn't thank the photographer! Um, my bad, little sizzle! 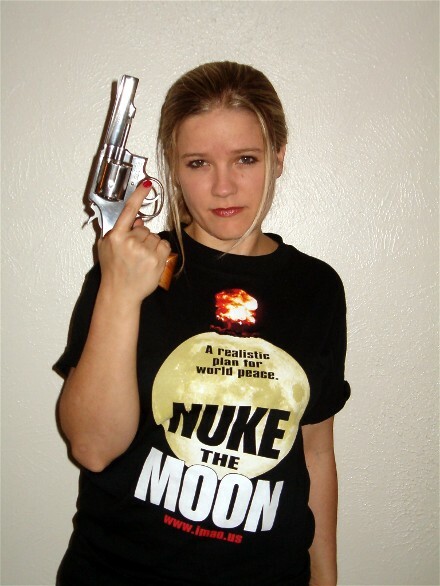 Anyway, I would LOVE to thank the little sizzle, Jessi, who shopped w/ me for the shirt, provided props (except the gun prop, provided by her neighbor - thanks Alison, I can't carry mine, I have no license yet and am a law-abiding citizen) and endured the grueling 3-hour photo shoot. Sista, I love you! !